Chimera. Photo courtesy Minneapolis Art on Wheels. Chimera begins with the assembly of a collection – three dimensional scans of animal skulls from the Bell Museum. These skulls are hybridized with human skeletons and exist in a virtual diorama space. 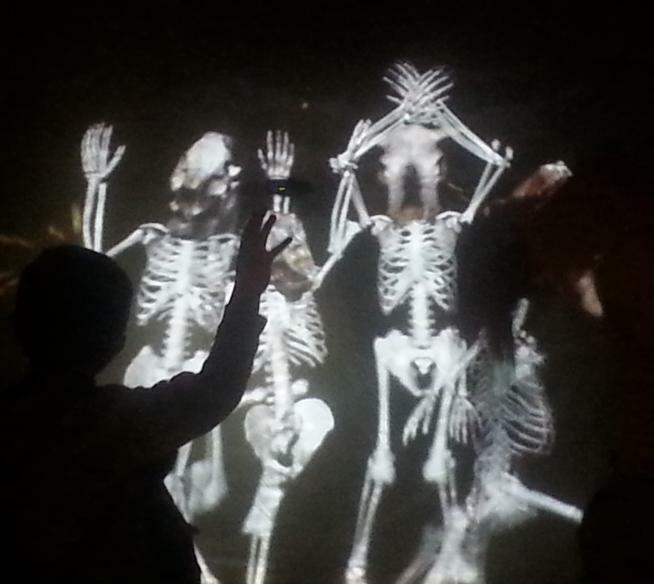 Each person who enters the projection is assigned a different chimeric skeleton that mirrors their movements, and each animal-human hybrid has a chance to remake the diorama according to their preferred habitat. Chimera was created by Minneapolis Art on Wheels members Aaron Westre, Andrea Steudel and Ashley Monk as part of the Bell Museum’s Fall 2013 Resident Artist Research Project. This project has been made possible by The McKnight Foundation.